This walk: 2012-2-9. 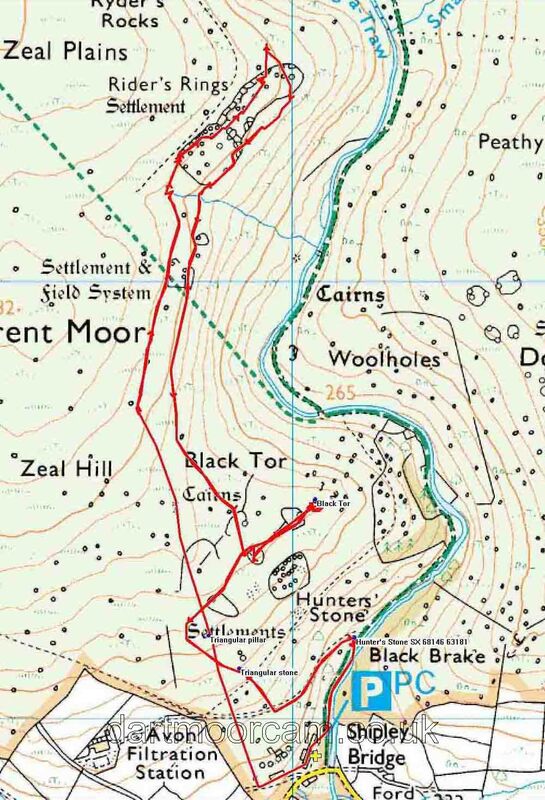 Brent Moor (Shipley Bridge) china clay works, Shipley Tor, plain boundary stones, Rider's Rings, Black Tor, roundhouses, enclosures, Avon Reservoir, Avon dam, rhododendron, The Hunter's Stone. Brent Moor (Shipley Bridge) china clay works - click image for large version. Built on the site of the 1847 naphtha works. Some background ..... Source: EA Wade, 1982, The Redlake Tramway and China Clay Works, Twelveheads Press, Truro. 1846, South Brent Peat and Peat Charcoal Works established at Shipley Bridge to extract naphtha from peat (p.11). 1847, Zeal Tor Tramway (horse-drawn) constructed to bring peat from Redlake - portable tramway lines were laid across the peat beds (p.11). 1850, business dissolved on 13 August (p.11). 1850, Leftlake china clay works first opened in about 1850 (p.8). 1858, closed because cartage across the moor to Harford was difficult (p.8). Re-opened 1922 by then owner of Redlake works (p.13). 1872, Brent Moor Clay Company formed. Worked former Knattabarrow clay works, became known as Petrie's Pit, close to the old Zeal Tor Tramway. A branch line was built and the old naphtha works converted to clay dries. Abandoned 1880 (p.13). Re-opened 1923 by then-owner of Redlake works, this seems to have been short-lived. 1911, The Redlake Tramway was opened 11 September (p.23), terminating near Bittaford, not Shipley Bridge. 1932, Work ceased, the worst year of the Depression (p.39). Leftlake china clay works was probably already closed by this time. "At and above Shipley there are a number of plain boundary posts defining the areas within which these two companies were permitted to build their settling pits, mica drags, and dries, to the east of Zeal farm and extending down as far as the riverbank (Avon)". Another view with Shipley Tor behind. Rider's Rings in the distance - click image to see a larger version. Described by J. Butler (1994) Dartmoor Atlas of Antiquities IV, 57.14, fig. 57.14 (page 144). Stream to be crossed on approaching Rider's Rings - the Bronze Age water supply? Gateway into the enclosure, bottom right. One authority states that entrances were made in recent times to let livestock in and out. Doorway of the roundhouse where we had a coffee break. Zoomed view to Black Tor, SX 6805 6350, elevation 320 metres (1049 feet). A large square enclosure within the main enclosure. This looks like another main gateway, near the north-west corner of the main enclosure. Crossing back over the stream. Looking down the valley towards the road running back to the car park. View of a small enclosure near Black Tor. A short panoramic scan of the small enclosure near Black Tor. There is a larger enclosure down the slope from here but we didn't visit it. Hut circle in the small enclosure. Rock pile at Black Tor (there are two). Looking back up the Avon valley - it looks as if Rhododendron has spread up this side of the tor (see at right). Rhododendron east of Black Tor. Another boundary stone as described above. This top face is inscribed 1948, Commander C. H. Davey R.N. 1919 - 1940 and Carew Coryton 1888 - 1916. Between the words "Carew" and "Coryton" is inscribed MI Douglas Pennant. There appears to be illegible lettering at the bottom of the face, just above the straight edge. The gaps in our efforts have been filled after reference to the Legenday Dartmoor web site's "The Hunter's Stone" page. The Hunter's Stone with the water works road behind. This walk was reached by exiting the A38 at South Brent (Exeter side) at the exit for Avonwick, Totnes and Paington. Drive north from the roundabout up towards the moor, straight across Harbourneford Cross, left at Gingaford Cross, pass a road going off on the left, follow the rtoad to the car park at Shipley Bridge, marked by the P symbol and yellow cross on the map.